A recent paper published in the journal Arthritis Research and Therapy reports that about half of the 202 patients with fibromyalgia studied reported foot pain. These patients often overcompensated, causing pain to radiate up into the knees, hips and back. Foot pain was also shown to increase the risk of falling and loss of mobility. Even though 1 in 4 fibromyalgia sufferers have foot pain, most do not receive treatment. In this article, we’ll discuss new discoveries on what causes foot fibromyalgia, alternate diagnoses for chronic foot pain, and a few methods for treating fibromyalgia pain. Fibromyalgia pain affects more than 5 million Americans, with half of those patients suffering from foot pain as well. New research published in the journal Pain Medicine reinforced previous research that fibromyalgia sufferers exhibit a loss of gray matter in the brain and an increase in the body’s “central sensitization” pain response. 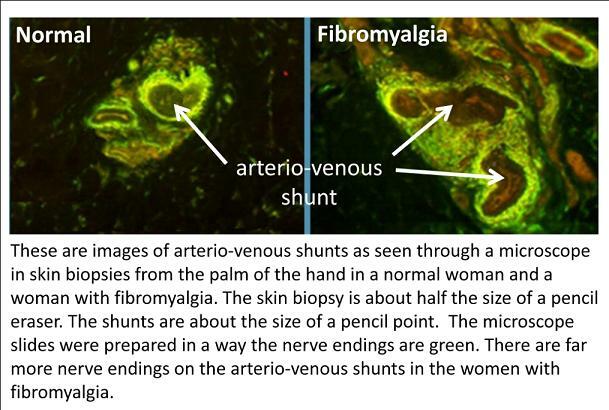 Yet, they also discovered that fibromyalgia patients exhibit an enormous increase in the number of sensory nerve fibers within the blood vessels of the skin located on the hands and feet. For those suffering from fibromyalgia, the brain scans differently than others, showing a loss in gray matter and hypersensitive pain response. In these areas, the blood vessels act as little radiators, speeding up circulation and regulating body temperature. When there are more nerve fibers in these regions, this activity increases — which explains why fibromyalgia patients experience worse pain in cold climates. New York researcher Dr. Frank Rice says that these extremities are also responsible for storing blood to dispense during exercise. So, faulty blood vessels translates to impaired blood flow throughout the body. That’s why patients feel pain in various other muscle groups and suffer from chronic fatigue. A comparison of biopsies in examining fibromyalgia. – Morton’s Neuroma is a benign enlargement of the nerve running between the third and fourth toes, causing tingling and sharp, shooting pain. This condition can be treated by cortisone shots or surgery. – Plantar Fasciitis is an inflammation of the soft connective tissue running from the heel, along the arch of the foot. A more supportive shoe with custom orthotics, night splints, and electrowave therapy can treat persistent heel pain. – Rheumatoid Arthritis involves pain and swelling around the joints. Fibromyalgia is a more generalized pain persistent throughout the body, rather than just in the hands and feet. Physical therapy exercises are often recommended to deal with this type of pain. Severe cases may require surgical intervention. What Can Be Done To Treat Fibromyalgia Foot Pain? Some patients find that hot and cold compresses help alleviate some fibromyalgia foot pain. Here at The Center for Podiatric Care and Sports Medicine in New York, we can take an in-depth look at your feet and give you the full, undivided attention you deserve. We’ll make sure you aren’t suffering from other conditions that typically cause foot pain. Custom shoe insoles add cushioning and correct any biomechanical conditions that may be contributing to your aches and pains. Additionally, we offer progressive treatments such as extracorporeal pulse activation therapy and physical therapy to help alleviate chronic foot pain. Expert surgeons are also on staff should you require a medical intervention.